My friend at college - Binoy used to say this comment always. 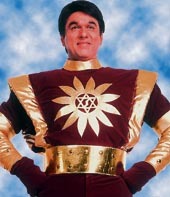 Whenever I(or we) do something to him, he says comically Sorry Shaktimaan. It turned out to be pretty funny, ha! It actually even looks funny now. To the scenes where Shaktiman shoots a bullet and catches it himself, to burning humans into skeletons - all look funny now. Take a loot and the end Credits of the serial - brings back lots of memories. I've been cut off with such things lately, I wonder who the superhero now is. Ben 10? Yeah, I hear that a lot. But I bet there would'n be a super hero which would share values? Or is there? Share a comment if you know something!